Imagine, if you will: You’re in bed, eight hours into a deep Netflix binge, when suddenly — you realize you’re hungry. Like, really hungry. So you pull out your phone, find the best late-night UberEats locale and order a spread fit for a stoned college kid: onion rings, loaded nachos, Buffalo chicken bites, a double order of mozzarella sticks and, to top it all off, a heaping bucket of shame. Twenty minutes later, the delivery driver shows up at your door. You grab the bag, shout “food’s here!” to an empty house (you’re not fooling anyone — we know it’s all for you) and start to close the door. But the driver’s not budging. He stands frozen, a look of awkward expectancy on his face. Is he waiting on something? Why is he holding out his hand? What’s going on? A tip. A tip is what’s going on. Our friend the delivery driver is waiting for you to hand him a little extra cash for his trouble. In case you consider tipping optional these days, it’s really not. Tipped workers bring home just over $10 an hour on average, and in many states, the hourly minimum wage for tipped workers is as low as $2.13. That means that your server or bartender could rely on tips for 75% or more of their income. If you can’t afford to tip, you can’t afford the service. But in a day and age when practically every company seems to include a tip option on your bill or have it conveniently built into an online interface, it’s easy to forget, or simply not realize, when a tip is actually appropriate. I’m here to tell you that tipping is still appropriate and appreciated in all the same old situations, and thanks to some innovative conveniences (think: grocery and food delivery services), a few new ones. So to quell the tipping confusion (and as a refresher for those of us who are still tipping like it’s 1995), here’s a handy guide that will answer the four Ws of tipping: who, when, where and why. To determine proper tipping, I scoured online message boards geared toward people in the service industry and checked (and triple-checked) my numbers with my Penny Hoarding co-workers, who have collectively worked just about every job in the industry. Here are some numbers to keep in mind next time you’re out and about. Servers at sit-down restaurants: 20% for average service; more if the service is exceptional or you linger awhile, especially if it’s over something like a $2 bottomless mug of coffee; and no less than 10% for bad service. If it was truly horrible service, feel free to speak to the manager about your experience. Bartenders: $1 per drink ($2 if it’s a complicated cocktail) or 15-20% of your bar tab. Food delivery drivers: 15-20%, but never less than $2, even on a cheap tab. Takeout: It’s never required, but order takers always appreciate $1-2. Counter service tip jars: Not required, but if you want to foster a relationship with your favorite barista, a couple dollars never hurts. Buffets: 10% for whoever clears the table. Room service: If the hotel doesn’t include gratuity on your bill, you should tip 20%. Housekeeping: $1-5 per day of your stay. Taxi and Uber drivers: 20% of the fare. AirBnb: Not necessary. A thank-you note and good review go a long way, though! Hairdresser: 15-25% depending on how complicated or lengthy your service is. Grocery delivery service: 20% of the total bill; more if the weather is bad, or it’s a large load. Furniture/Large package delivery: $5-10 per person. Movers: $20 per mover — more if the drive was long. Pro tip (hah! ): If you, like me, are really, really (I mean really) bad at math, you can download a tip calculator like this one. Just plug in a couple numbers, and it’ll tell you exactly how much to leave. Another tip (hah! again) that has changed my life is this: When you get the bill at a restaurant, move the decimal point one place to the left, and then double the new number. So if the bill comes out to $15.50, you would move the decimal point so that your new number reads 1.550. Then, you double the new number, getting $3.10. Voila, a 20% tip. Remember, while we love a good deal (and a good coupon!) here at The Penny Hoarder, you should always tip on the pre-discounted amount. If you use a coupon for a salon visit, your tip should be a percentage of the regularly priced service. 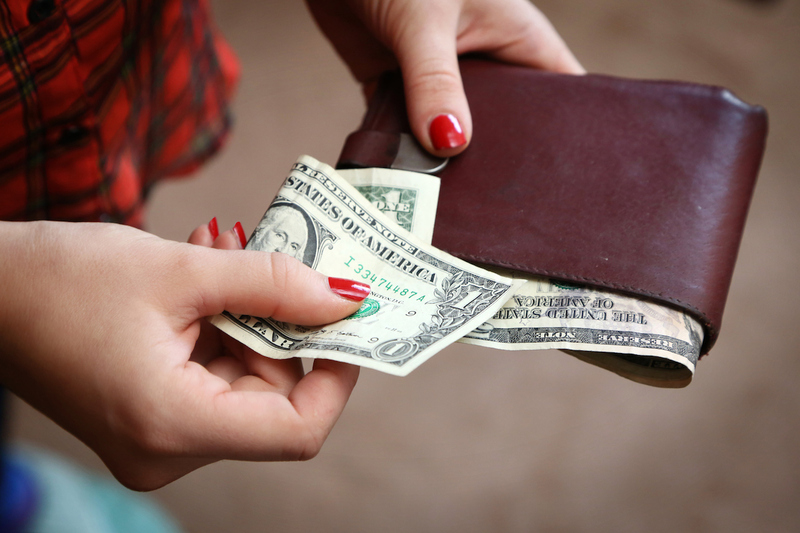 Your Turn: How do your tipping habits compare to our guide? Grace Schweizer is a junior writer at The Penny Hoarder. She’ll never admit to having a double order of mozzarella sticks delivered — but if she did, she’d also want you to know she didn’t forget the tip.